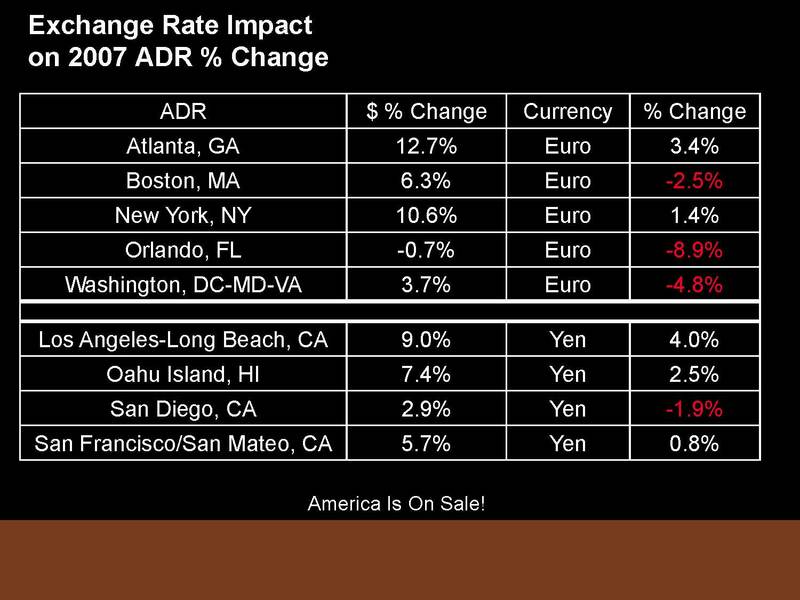 Here’s Jan Freitag’s Smith Travel Research July update . . .
At NABHOOD, Jan Freitag pretty much updated everything through at least May, and gave us some data through June 2008. 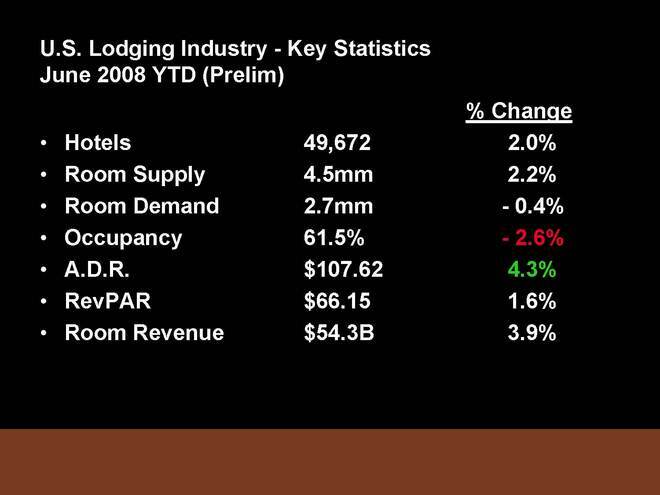 You should note that although room demand was down slightly (-0.4%) and occupancy was also down by 2.6% for the year to date, RevPAR was still up 1/6%. This evoked some important advice that is becoming a mantra in the industry: “Lowering prices will NOT enhance revenue. It will only inspire a destructive downward spiral.” We can only hope that the hotel industry will pay attention this cycle. It seems to be doing so thus far. It is also very intriguing to see what is happening with Occupancy and ADR in the Key 15 Markets. San Francisco led the nation in occupancy INCREASE, followed by Miami, Boston, Oahu, Orlando and New York. 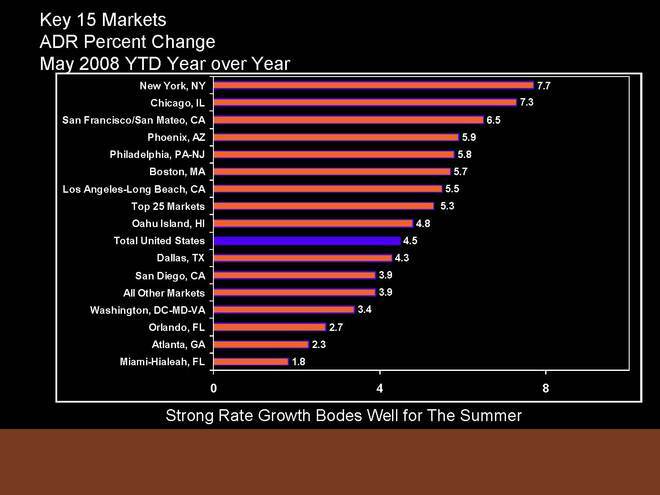 Occupancy drops were led by Phoenix, Philadelphia, Atlanta Dallas and Chicago. In general, the Coastal areas best maintained their occupancy. I also find it particularly valuable to see that in the coastal areas — such as Atlanta, New York, Los Angeles, Oahu and San Francisco, the EXCHANGE RATE impact has been so significant in the ADR change (ranging from 4% in LA and 3.4% in Atlanta to a mere 0.8% in San Francisco. But somehow it has had a NEGATIVE impact in Orlando of 8.9%, 4.8% in Washington, and 2.5% in Boston. STR projects “pipeline attrition” or a fall off in the number of projects now in the supply “pipeline”. That is bad if you are developing a new hotel. But it is great if you have one open or you are a developer who makes it through the pipeline. This is the “silver lining” of the current slowdown. The slowing economy has already brought slower demand and will bring slower supply growth. But the top markets are likely to outperform. The weak dollar means that the U.S. is “on sale” and will help demand with foreign travel — particularly if we can ease issuance of visas and otherwise facilitate travel and a “friendly environment” for our foreign friends who want to see America. Leisure travel may feel a greater negative impact in the next few months than business travel, and this is definitely the time for revenue (and expense) management discipline. To download and see the full slide show presented by Jan Freitag, click here Download file . Hospitality Lawyer take on things.